I can't wait for Aaron to be gone (yeah) I don't even recognize any of the Thor characters anymore as they are shadows of themselves. Even the destroyer is not spared from this butchery of this writing. I know when the Destroyer was used early on things would not bode well for the original Thor and company. I also know that Jane will save the day so move over boys heeerrrrs Jane. I hope that another writer comes in a fixes a lot of this mess. 100% agreed. This is terrible. With the cancellation of legacy books and a new EIC, let's wait to see some good news. IMO, there seems merit in BOTH those sides w/the portrayal of Odin here. But the common factor is frustration. He's been a zoundsworthy annoying enigma (ie.crappy king) since he banned his whole kingdom. Putting defiant Odin on the cover like that was a dumb tease too. 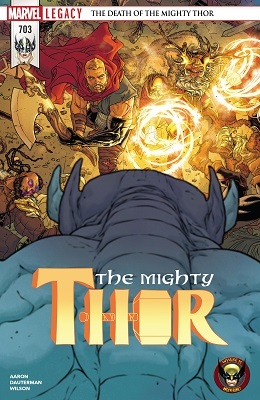 As for Jane, as solicits suggest she isn't done so it makes sense that she should show up as Thor again against Mangog. This 'intervention' was overdue and neatly included some reader friendly chronology fitting; it was good to see Sam and Stephen. However, it felt a bit... abrupt that she would just conceed -if not GIVE UP- to their arguments at this time after all her do or die character building this entire run. A moment of weakness? Interesting the Odinson could stay Mjolnir from doing whatever it wanted to do, go whereever it wanted to go. Maybe it was empathizing with Jane before her final decision - or was it still an undecided Jane guiding it? Nice art. Poor Heimdal. Solomon keeps propsworthy pizza peddling alive in the MU. I was pissed off. Since when does Odin need his wife to fight for him while he cowers in fear? Odin is a king that has led his army in person so what's this crap about? Plus Odin has defeated Magog by himself in the past so what's the big deal now. I fully expect Jane to come swooping in to nobly sacrifice herself after everyone else has been eliminated.